OSWEGO, NY – Bruce Racing and Oswego Speedway driver Mike Bruce will hold their Pathfinder Bank Small Block Super team fundraiser this Saturday at the Woodchuck Saloon, beginning at 1 p.m.
Mike Bruce cruises Oswego Speedway with his No. 22 Pathfinder Bank Small Block Super. The fundraiser will feature chicken BBQ and pulled pork dinners for $10, available for eat-in or take-out. Delivery will also be available with a three dinner minimum. Several raffles will take place through the day along with a 50/50 drawing. Entertainment will be provided by Ron Gray’s Millennium Music. 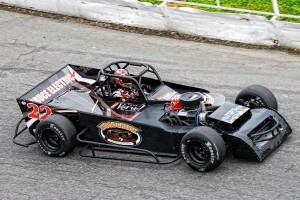 Woodchuck Saloon is located at 1 Mitchell St.
Bruce captured his first career Small Block Super victory at Oswego Speedway last season, and backed it up with two more main event wins following in 2014 to finish eighth in the final drivers’ standings with the No. 22. The former Speedway Rookie of the Year would also go on to finish fourth in the 2014 Bud Light SBS Classic as a part of Budweiser International Classic Weekend. Oswego Speedway’s 2015 racing season will kick off on May 9 with the 65th annual opening night celebration featuring the lid lifters for the Novelis Supermodifieds and Pathfinder Bank SBS, as well as the 75-lap Richie Evans Memorial for the Race of Champions Asphalt Modified Series presented by Planet Fitness and Mitchell’s Speedway Press.